So golf alignment is critically important and here’s a simple exercise that you can quickly and easily do to check your feet alignment. To do this golf alignment exercise setup to a golf shot as normal and get comfortable. 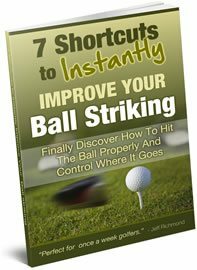 Then just before you’re ready to hit your shot, get two golf balls and without moving your feet place them directly behind your heels so they’re touching your feet. Now take your feet away and go back behind your ball down the line of your target and see how good your alignment was. The beauty of doing this golf alignment exercise is that it shows you exactly where you are aligning your feet and then you can simply change the golf balls so they align correctly and then setup with these balls touching your heels. If your feet have been aligned incorrectly for a while then it will feel quite strange when you align them correctly. But keep practicing and before long, your new feet golf alignment will become second nature. So that is a great and easy way to check the alignment of your feet. But you still have to check the alignment of your knees, hips and shoulders as they also have a big affect on your golf shots success. And the absolute best way of checking this is to get a person to get a golf club and lay it across each part of your body once you’ve setup to a shot. 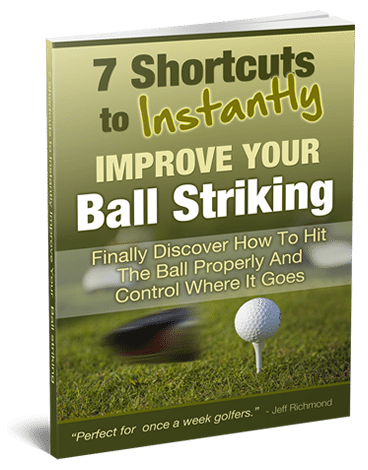 But remember, you want each part of your body to be aligned parallel to the starting line of your golf shot. You do NOT want your body to be aligned directly at your target. A good way to picture this is to imagine yourself setting up to hit a golf shot on railway tracks. Imagine the golf ball on one rail and you’re standing on the other rail. Golf alignment is critical to your success and consistency so check it often, because it’s very easy to align yourself incorrectly without even knowing. But now you know exactly what you need to do to check your alignment so you have no excuse. So please make an effort to check it often…because it can only do your golf game good.